With supply chain performance improving, Apple seems to be catching up to the demand for the iPhone 5 with US carriers already as well. Apple Store checks in 100 locations by analyst Gene Munster and his team at Piper Jaffray showed that for the first time availability was above 20% for all major US carriers that have the iPhone in their portfolio, including Sprint. The team has been consistently polling 100 Apple Stores for the last three weeks 30 minutes after 10pm, when the new iPhone 5 units are up for reservation, and the stores spanned 10 zip codes in total. With 54 percent availability for the AT&T model in stock, 24 percent for the Verizon version, and 84 percent for Sprint now, things are much better in comparison with just last week, when Verizon and AT&T stock of the iPhone 5 was very low. "We believe this is an important step for Apple as it appears they are finally gaining momentum in being able to keep up with demand for the iPhone 5. We believe that if AT&T and Verizon device availability follows the same trend as Sprint, it may only be 2-3 weeks before iPhone 5s are consistently available to customers," Munster clarified today. Now bunch of fruit fans would come and will talk about fruit and its fake demands. oh please all this crap about Apple having so much demand that they're not able to meet it is crap and nothing more. Just look at the article today on PA revealing sales of top ten in smartphones in which Apple sales aren't even half of Sammy's....Astalaveesta Apple! Supply goes up or demand goes down??? It's easy to publish anything when the researches are for USA only and everyone forgets that USA isn't the big name for surveys nowadays!!! Come to countries like India and China, where suppliers are begging (actually insisting) the dealers to buy at least 3 iPhone 4S with 1 iPhone 5, so that they can prove to the world that Metal Glass brick sells very well! A product as great as the i5 has high demand. Or maybe just maybe. The article is correct, nahhhh that couldn't b it lmao. U guys crack me up with this stuff. The iPhone 5 is n huge demand and that's that. I don't care who can't stand me, and will cheer on who I want. And please stop responding to my articles. If this survey finding is true then I feel sorry for the people of USA. 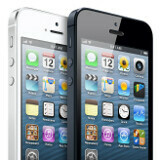 I would like to see Apple add a 5.95" model to the iPhone 5. Make it edge to edge screen and make it run iPad HD apps. Price it around $299 and $399 respectively on a 2-year contract. They could come in 32GB and 64GB models. This would change the game for Apple and would allow them to display their dominance. MSRP would be $849 and $949 off contract. This would be killer!! !